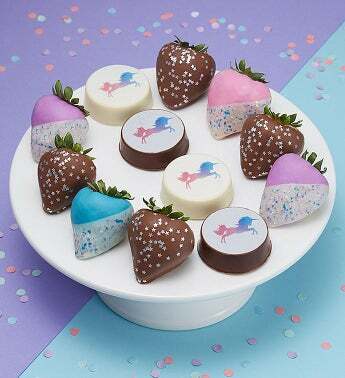 There’s magic in every bite of our unicorn-themed treats. Eight scrumptious Berrylicious® strawberries are drizzled in creamy milk or colorful chocolate and topped with glittery rainbow sprinkles. Adding to the sweet fantasy are four decadent cookie sandwiches, dipped in white or milk chocolate & decorated with these mythical creatures. It’s the stuff of legend, perfect for unicorn lovers of all ages.